Child Protective Services needs our help! There are nearly 8,000 children in the San Antonio area who have been abused or neglected and are now under the care of Child Protective Services. We would like to make sure each of them receives a toy this Christmas! Please join KENS 5 Chief Meteorologist Bill Taylor, AFFCU, Atlas Floors Carpet One, Mister Sparky, Acceptance Insurance and Target as we collect toys to give these children a Merry Christmas! Drop off your unwrapped toy at our sponsors' locations from Nov. 19 to Dec. 10. Bring an unwrapped toy to the KENS 5 Studio at 5400 Fredericksburg Road. Call 210-366-5000 for more information. 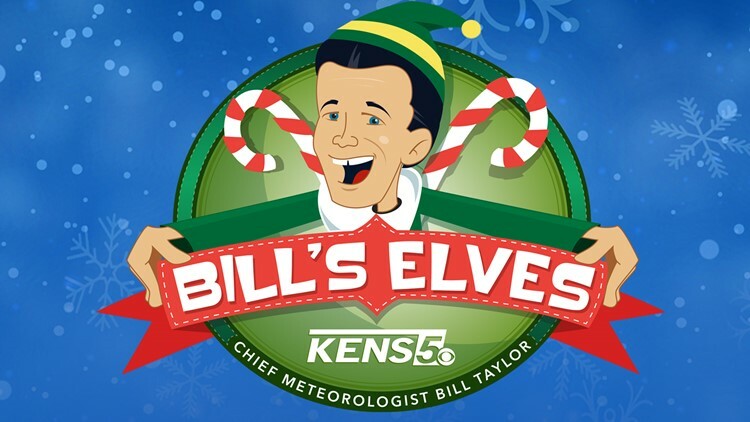 Become one of "Bill's Elves" and make a difference for a local child! Thanks to your generous donation, we can help make this Christmas one to remember.